You’ve been having the same nightmare, over and over again – the one where, all of a sudden, a big, bad monster won’t allow you to contact any of your customers. You can’t reach anyone with news. Or special offers. Or anything. Ever. That monster is called GDPR. 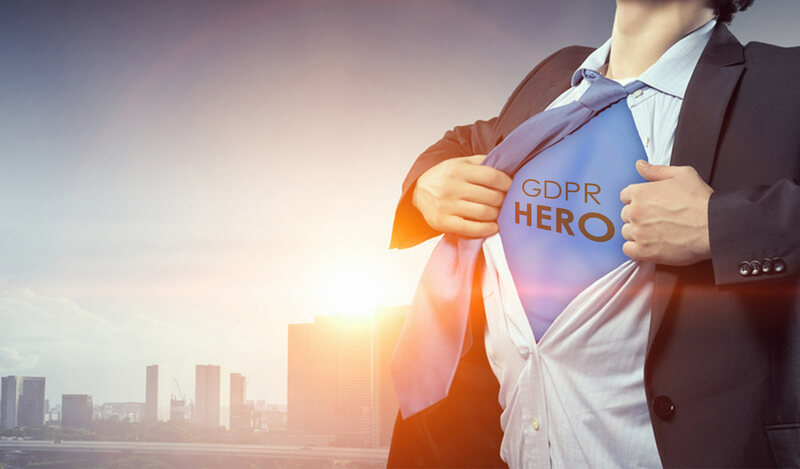 The majority of business owners and marketers all over Europe have been wrestling with the onset of GDPR – General Data Protection Regulation – for years. It’s an EU regulation adopted in April 2016 and enforced in May 2018 to give people control over their personal data and to simplify international business by unifying the regulation within the EU. And, even though the UK is planning to leave the EU in 2019, Parliament granted Royal Assent. In practice, the new regulations mean that companies (big or small) must store data using pseudonymization or full anonymization by default, and that companies need to be fully and actively given consent by a customer to process information that makes it possible to identify that customer. Customers also have the right to withdraw this consent at any time. When the EU first published this aspiration two years ago, many company managers and marketers froze from the fear of massive fines, the workload of preparation, and insecurity about what the change would mean for their customer base. The idea of losing a great number of customers – and of those customers who opt in via GDPR, losing part of their information that provides a vital part of personalising communication – caused a nightmare for many. 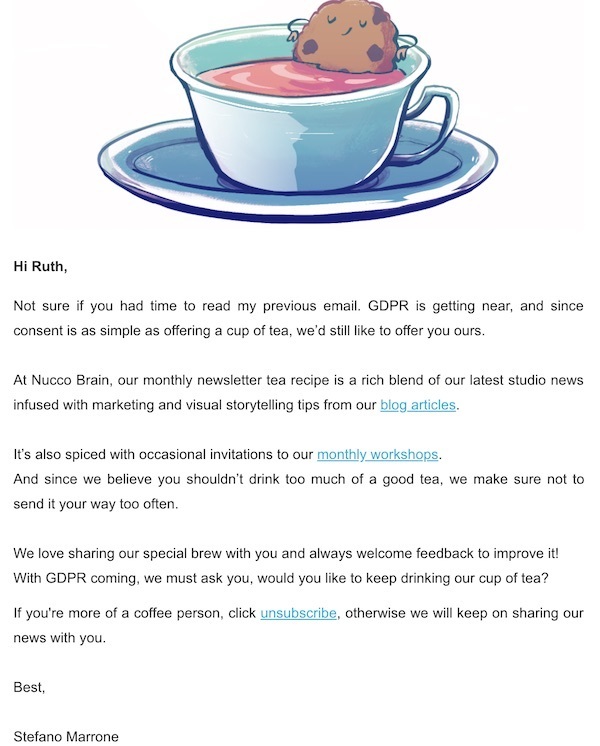 This was compounded by the fact that many companies sent out consent emails to customers they already had a commercial relationship with which is not necessary according to GDPR. By doing this they are likely to lose valuable customers that have engaged before, because they are now given the perfect chance to opt out. As behavioural scientists, we can help with 1-4 (well, no better or worse than anyone else) but we can help turn number 5, ‘Impact on consumer acquisition’ from a problem to an opportunity. With the emergence of the internet as a commercial force back in the early noughties companies started collecting huge amounts of data; some of which neither their customers nor they themselves could handle. Soon, loads of information was stored making consumers uncomfortable, and ad blockers popular. Scroll forward to May 2018 and GDPR forces a game change primarily to benefit consumers and give them control. But it could bring just as much benefit to your company if you use it to reconsider your consumer relationships: build trust; build meaningful interaction; and overtly acknowledge consumers’ value and preferences. 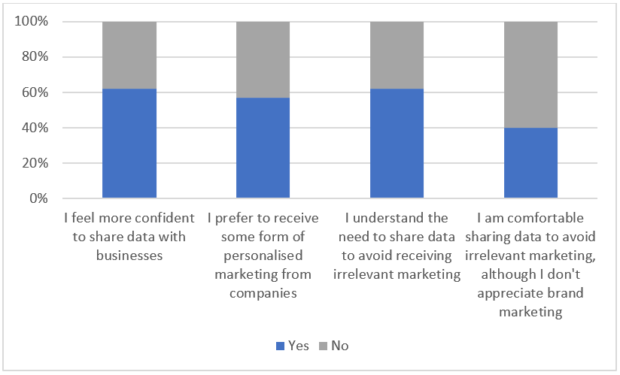 So, according to these results, the nightmare of no consumers wanting to receive any more email communication and forbidding any data processing was really just a bad dream. The reality looks different – and it will be if you take the right actions to build trust and value: WHat are they? This re-permissioning email is definitely not missing creativity. It’s short and it draws a clever comparison, however, it’s still not giving people the information they want to have. As the survey results suggest, people don’t need to know details, as long as they know they feel in control about what is happening now and in the future. Nucco Brain is missing a bit of clarity here. The analogy is stretched, the subject line is indirect (covered by the analogy), and the call to action is not really calling for the right action (no active re-confirmation). Subscribers are likely to be confused by the email and end up opting out. Asos is taking a different approach. Their email couldn’t be clearer, more straight-forward, easier to understand and more reduced to the essentials. They’re all about making people feel in control and they do it well. 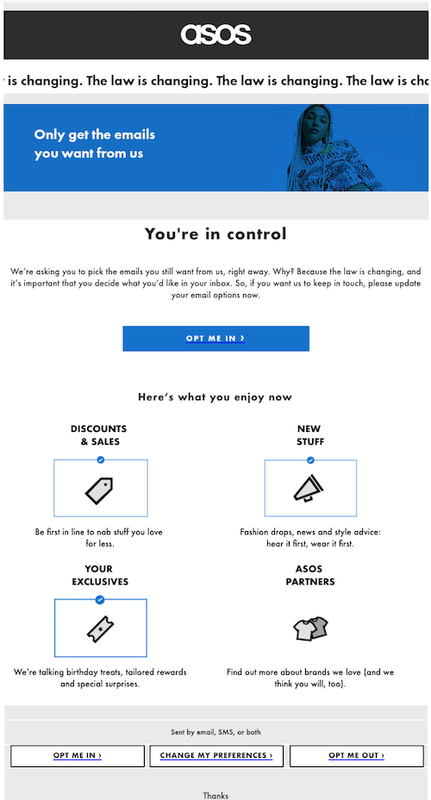 What’s questionable about Asos’ email is that they’re still trying to seduce people to opt in. The choice to opt out is there in the footer, but it is given much less emphasis. Take a look at how The Galleria Outlet Shopping solves that. In addition to being clear, straight-forward and informative, their email is neutral as well. Subscribers have an equal opportunity to opt in or out presenting true control. All The Galleria does to get people to make a decision is adding a deadline. 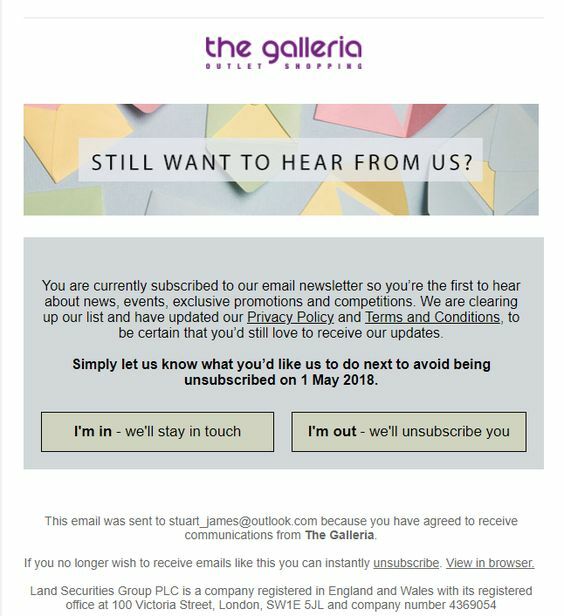 This easy to understand and neutral email is hitting the essence of GDPR – making people aware and giving them a true choice. But this brings back the nightmare – you can see everyone clicking ‘I’m out’. Trust us, this won’t happen. Early internet marketing left its mark, but the principles in the table below tell you a bit about how people actually behave. Evidently, GDPR has forced a pivot from measuring the crude quantity of contacts to a measure of purer quality of contacts. Fine in principle, but it’s hard to lose so many contacts and sell that as a benefit to the C-Suite in the boardroom. So where is the dream? People are all about feeling in control. Subjects felt comfortable opting-in without knowing exactly what is done with their data as long as they were sure to be in control at all times. Remind them of this. Information related to the self is salient and automatically catches people’s attention when they were focussing on something else. Don’t overdo it though, online privacy violation creeps people out and may cause physiological stress. If lots of people do something, tell only those that don’t do it how prevalent that behaviour is – see our piece on ’Hyper-local, visible action is key to encouraging green living’. 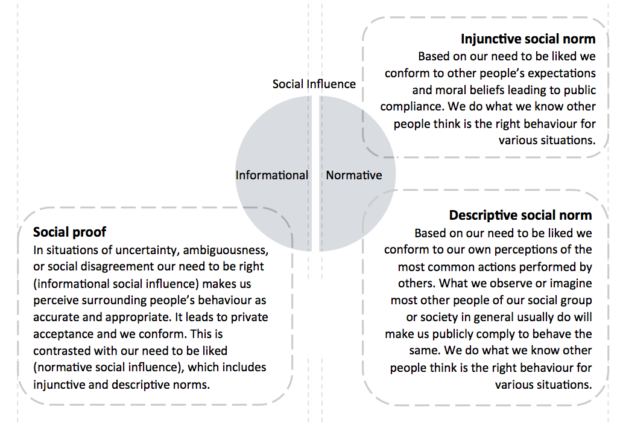 If lots of people don’t do what you want, then give them a clear, proximal, concrete story of someone who does – people are more likely to do things that are done by people they can identify with. People don’t like missing out and losing things they think they own. See our post on ‘The dinner party kit: a bluffer’s guide to behavioural economics’. Irrespective of the sector you’re in, or the content you deliver, these tips will help. And there are ways to identify bespoke behavioural interventions and measure likely effect before live – our Comprehension-Motivation Test© is a product we’ve designed – and used – to do just that. And of course, a properly founded, strict RCT ( Randomised Control Trials) takes A/B or multi-variant testing to the Gold Standard level most businesses want. Is there anything else that helps? Yes. It is true: the opportunity to turn the nightmare into a dream does not mean your database won’t get smaller. Because of GDPR it is likely that you are no longer allowed to contact some consumers outright, or use some of the consumer information you have now. But having some of those people was useless in the first place; you gain nothing by having a huge database of people who aren’t interested in your communications. But a smaller database doesn’t mean smaller conversion rates. You really can have both. Once you’ve excluded uninterested people from your calculations, you’re left with motivated people. Add to that a behavioural layer using techniques to increase interaction from those quality constituents, and you have a quality database like you never had before (really). So, after learning about the real impact the new GDPR can have on your operation, the scary nightmare doesn’t seem so… scary? Sweet GDPR dreams to all marketers, from us at The Hunting Dynasty. Moore, R. S., Moore, M. L., Shanahan, K. J., & Mack, B. (2015). Creepy marketing: Three dimensions of perceived excessive online privacy violation. Marketing Management, 25(1), 42-53.